Last night, we posted an item on a Washington Post story that used one Arkansas county as an example of rural Americans' wariness of President-elect Barack Obama. This morning, the Lexington Herald-Leader offers the other side, a story about of the few rural counties in Kentucky that voted for a decidedly urban president. 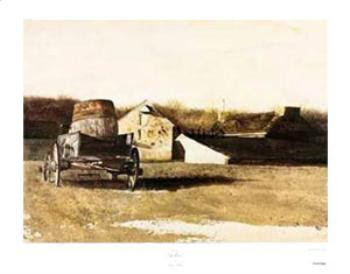 "Wyeth was also born in Chadd's Ford, and except for the time he spent at his family's summer home in Maine, he lived his whole life there," National Public Radio reports. "His entire body of work is drawn from these two places: images of rural America and the people who lived there, realistic but often imbued with hidden meaning." (Read more) Below is Cider Barrel. One headline on The Washington Post Web site read "Rural residents wary of Obama's America," but the story was only about Monroe County, Arkansas, and the people one resident dealt with during a typical day. The county lies near the heart of "the McCain belt" of counties that voted more Republican last time than in 2004. 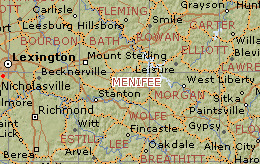 (Monroe is the red area east of Little Rock, which appears in white.) For the original New York Times map, click here and then on "Voting Shifts." "On the eve of the inauguration, a sense of apprehension prevails in a place that rejected the new president and now warily awaits his version of America," Anne Hull wrote, introducing her itinerary with Wayne Loewer. "The 52-year-old farmer is a conservative Democrat who bet on Republican John McCain and lost, a description that would apply to many in the white South. Now Loewer wonders about his place in Obama's America. 'I'm worried that he's not gonna understand the rural way of life,' he says ... and everywhere he goes, the same anxieties are expressed. Overtly, it's about guns. Less publicly, it's about race. Loewer told Hull he voted for Bill Clinton, isn't a churchgoer, supports abortion rights and thought McCain would be another version of George W. Bush, for whom he voted. "He was tired of Bush and what he saw as a failed war in Iraq. He thought Obama's farm policies were stronger than McCain's. But he says Obama lost his support when he made his infamous remarks at a private fundraiser in San Francisco about small-town Americans who feel marginalized and 'cling to guns or religion.' Not long after Obama's comments, Loewer received mailers from the National Rifle Association saying that Obama planned to ban hunting, restrict gun laws and close 90 percent of gun shops. Several nonpartisan fact-checking groups discredited the claims, but the gun dealers Loewer talked to said the NRA had it right. 'When Obama got elected, I went out and bought a rifle and pistol shells for every weapon I own,' he says. 'I bought $400 worth of ammo.' Not that Loewer feared Armageddon or a race war; he was stocking up in case the warnings from the NRA and the gun dealers came true." Many other gun owners did likewise. Hull's reference to race is quckly followed by her report that Loewer "has noticed that blacks around Brinkley ... have a newly emboldened attitude. He's heard about people cutting in line at the grocery store or 'doing a little victory dance at the Kwik Shop.' Loewer shrugs. 'If he brings us out of this mess we're in right now, I'll get out in the street and fist-bump with them,' he says." Later in the story, Hull quotes a co-op manager who says local voters see "second- and third-generation blacks who are living in the projects" and think, "How can we expect somebody like Obama to do a good job when they can't even handle things around here?" But he adds, "I think he's a bright guy." The last encounter is with Loewer's main farmhand, Phil Hicks, who is black, voted for Obama, and isn't worried that an urban president will neglect rural people. "A lot of people from the South just got that mentality," he says, telling Loewer, "I know you ain't nothing like that." To read the full story, click here. For a transcript of Hull's online discussion with Post readers about the story, click here. Green energy has taken center stage at some Senate confirmation hearings this week, as the secretary-designates of energy and agriculture answered questions on alternative fuels. The billion-gallon coal-ash spill in East Tennessee has made disposal of such waste "a pressing national environmental concern that has already sparked legislative proposals and the prospect of new regulation," reports Juliet Eilperin of The Washington Post. The issue has been "largely ignored" though the federal government has deliberated on it for three decades, Eilperin reports. Now, she writes, it may move ahead of climate change on the environmental agenda of the new Obama administration. It was a biting cold day in December. I shivered violently as I looked out at a sea of sludge that had swept down and moved homes from their foundations. It was Dec. 19, 1981, and I was in Eastern Kentucky covering the first big story of my new career. A coal slurry pond on the hillside over Ages Hollow — in my mind I always hear the word “holler” — had broken open and swept down on the small village. The Internet is now Americans' No. 2 source for national and international news, surpassing newspapers and second only to television, according to a recent survey by the Pew Center for the People and the Press. The figures suggest that major newspapers are likely to continue their increasing focus on local news, closing Washington and state-capital bureaus and cutting out rural circulation and coverage. Delorice Bragg and Freda Hatfield, widows of two miners killed in a Massey Energy coal mine in January 2006, urged U.S. District Judge John T. Copenhaver to reject the plea deal being offered to Massey subsidiary Aracoma Coal Co. The plea deal would impose 10 criminal counts, including one felony, and $2.5 million in fines on Aracoma but would not allow federal prosecutors to pursue charges against any Massey employees. "Under the plea deal, prosecutors agreed not to pursue charges against parent company Massey or any of its officers or agents," writes Ken Ward Jr. of The Charleston Gazette. "They also agreed that the government 'does not have evidence suggesting that Massey knew, approved or acquiesced in, Aracoma's failure to maintain true and accurate records of escapeway drills.'" Many including Bragg and Hatfield feel Massey employees deserve much of the blame for the deaths. Aracoma "entered its plea Wednesday, admitting to not providing a proper escape tunnel out of the underground mine, to not conducting required evacuation drills, and to faking a record book so it appeared the drills had been done," Ward reports. Falsification of the evacuation drill record book is the only sort of violation that can draw felony charges under mine safety laws. (Read more) We first reported the settlement in the following blog item. "Less than a week before leaving office, the Bush administration is preparing to issue an emergency health advisory for drinking water polluted with the toxic chemical C8," reports Ken Ward Jr. of The Charleston Gazette. The proposed federal standard, while stronger than the one currently in place, is 10 times weaker than a standard put in place in New Jersey. "C8 is another name for ammonium perfluorooctanoate, or PFOA," writes Ward. "DuPont Co. has used the chemical since the 1950s at its Washington Works plant south of Parkersburg. C8 is a processing agent used to make Teflon and other nonstick products, oil-resistant paper packaging and stain-resistant textiles." There is growing evidence that even low levels of C8 and other PFC's in the blood stream can pose health risks. UPDATE, Jan. 16: For other rural-related items in the bill, from the Daily Yonder, click here. The House Appropriations Committee "today released details of an economic stimulus package that would include $6 billion in grants to bring high-speed Internet lines to rural and other underserved areas," reports Cecilia Yang of The Washington Post. The panel "also called for $650 million for the National Telecommunications and Information Administration to provide coupons for consumers to buy converter boxes for the Feb. 17 digital television transition." The coupon program is out of money and is keeping a waiting list. Twenty House Democratic freshmen who represent primarily rural districts want rural America to have its share of the stimulus plan coming to Congress. "A significant amount of any economic recovery package has to be invested in rural areas, Rep. Betsy Markey and 19 of her colleagues said in a letter today to House Speaker Nancy Pelosi," reports Robert Moore of The Coloradoan in Fort Collins. "The infrastructure of rural economies is in crisis," the Democrats said. "The economic recovery and reinvestment plan must invest significantly in maintaining and upgrading infrastructure in rural and other distressed communities, which will create local jobs. 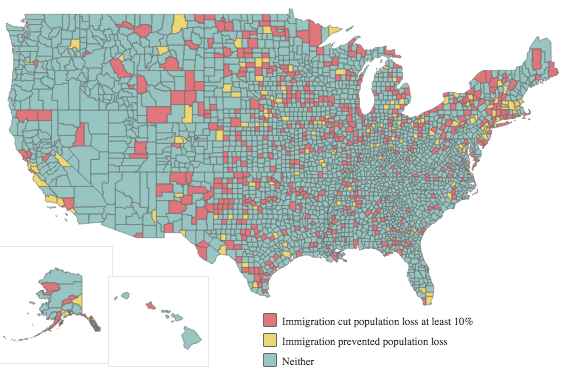 Among other viable options, the quality of life in rural America can be improved by expanding broadband technology, public transportation, and water and sewage systems." The letter stemmed from a report by Democratic Whip James Clyburn of South Carolina, which called for the need to include rural areas in any economic stimulus. (Read more) View the letter and signers here. The Department of Veterans Affairs announced that it is giving states $22 million to improve services for rural veterans. "The extra funding is part of a two-year VA program to improve the access and quality of health care for veterans in geographically isolated areas," according to a VA release. "The program focuses on several areas, including access to health care, providing world-class care, the use of the latest technology, recruiting and retaining a highly educated workforce and collaborating with other organizations." The funds will allow states "to increase the number of mobile clinics, establish new outpatient clinics, expand fee-based care, explore collaborations with federal and community partners, accelerate the use of telemedicine deployment, and fund innovative pilot programs," VA said. To read more and see a state-by-state break down of the available funds, click here. Pilot plant making ethanol from corn cobs in S.D. For some time we've reported about metropolitan newspapers abandoning circulation and coverage in rural areas, and now the trend has shown up in broadcasting. 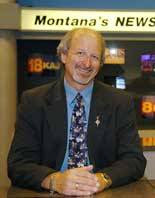 A Montana television station has laid off a veteran journalist whose special reports had statewide impact in Montana, especially its vast rural areas, and whose work in freedom of information served journalists nationwide. Marquand's final report for the station was a 2½-minute look ahead at stories for Western Montana in 2009, including several of rural interest in a state that was 46 percent rural at the 2000 census. Because your blogger knows Ian and his journalistic skills well, I can say that the only part of the report that was off base was his final line: "See you next year." As freedom-of-information chairman of the Society of Professional Journalists, including my term as president in 2001-02, Marquand produced Open Doors, a resource book for journalists to use laws on open meetings, courts and records. In 2004, SPJ awarded him the Wells Key, its highest honor to a member, for service to the society. On the FOI Committee's blog, Chairman David Cullier called Ian a "longtime SPJ FOI hero." Ian says his layoff surprised him, but he is looking forward to life's next phase. He told Szpaller, “It may be that it will be something in television. It may be something elsewhere in journalism. It might be in the academic world,” he said. “I think I bring a certain group of skills that would be useful in a number of areas.” (Read more) I agree. Good luck, my friend. The lobbying battle over a proposed delay in the Feb. 17 transition to digital television went public today, as the Consumer Electronics Association said a postponement would be confusing, “serious and potentially disruptive.” CEA made its arguments in a letter to John Podesta, co-chair of President-elect Obama's transition team, who last week asked Congress to delay the Feb. 17 mandate, mainly to help poor and rural TV viewers, since the federal coupon program for converter boxes has started and a waiting list has begun. CEA represents major manufacturers of TVs and other electronic goods. Its president and CEO, Gary Shapiro, said in the letter, “A change in the date could engender skepticism, confusion and distrust the next time government asks them to undertake specific actions in anticipation of a major event. ... With awareness now close to 100 percent, any change will be confusing and difficult to explain,” and perhaps also expensive. UPDATE, Jan. 13: Two big telecommunications firms are on opposite sides of the issue, with At&T endorsing a three-month delay and Verizon opposing it, Ted Hearn of Multichannel News reports. Confounding farm market analysts, the U.S. Department of Agriculture estimated today that U.S. corn production and stocks of the crop would increase in the current marketing year, which ends Aug. 31. USDA also said expected use of corn would decline because of reductions in "livestock feeding, ethanol use and exports," writes Janie Gabbett of MeatingPlace, a news site for the meat industry. "Market analysts had expected USDA to decrease corn production and expected a much smaller increase in ending stocks," Gabbett reports. The main factor in the forecast for decreased use was ethanol, because producers are losing money. "The projected season-average farm price for corn was lowered 10 cents on each end of the range to $3.55 to $4.25 per bushel." Jeff Caldwell of Agriculture Online writes, "All eyes now turn to South America, where weather conditions will have a lot to do with crop size there and, in turn, market prices here. And, soybeans will be leading the charge, analysts say." (Read more) For the full USDA crop forecast, click here. Federal investigators from the Office of Surface Mining are finding inconsistencies in the regulation of coal-slurry impoundments by the state of West Virginia. Ken Ward Jr. of The Charleston Gazette writes, "Department of Environmental Protection officials do not properly apply 'safety zone' rules for impoundments built on top of underground mine workings, according to the report." The report comes during nervous times in the coal industry, following the highly publicized coal ash spill in Tennessee. (Read more) To view the Gazette's graphic on coal-slurry dam problems, click here. As the length and severity of the recession continues to increase, areas of the country previously resilient to the economic downturn are beginning to struggle. "For decades, high-growth states like North Carolina, Georgia and many of their neighbors showed extraordinary resiliency during national economic downturns," reports Dan Fitzpatrick of The Wall Street Journal. "But increasingly, the region appears no longer able to stave off the slowdown." For example, "North Carolina's widely lauded economic transformation of the last three decades -- in which the state diversified away from its dependence on agriculture and textiles and into technology, banking and pharmaceuticals -- is proving no match for what could be the longest and deepest U.S. recession since World War II," Fitzpatrick writes. The state is experiencing a 26-year high in unemployment at 7.9 percent and some experts are predicting double digit unemployment for 2009. To see state-by-state unemployment data from the Bureau of Labor Statistics, with year-over-year change in percentage points, click here. The recent coal-ash slurry spill at the Tennessee Valley Authority's steam plant in Kingston, Tenn., highlights the need to bring the Depression-spawned federal utility back to its research and environmental roots, writes Tom Eblen of the Lexington Herald-Leader, who covered TVA in his days as a reporter in the Southeast. Former TVA Chairman S. David Freeman told Eblen, "We taught the rest of the nation about flood plain management. We had a civil-service system before the [rest of the] federal government had one. TVA was the fertilizer research center for the whole world, and we developed all kinds of fertilizers. We taught soil conservation to the farmers." But in the 1980s, Congress eliminated many if not most of TVA's non-power programs. "The power part of the system was the tail," Freeman said. "I think what happened over the years was the tail became the dog." The financial success of farmers depends on both business savvy and basic agricultural ability, according to a new study by Purdue University. The land-grant school asked some of the most financially successful farmers which of their skills they considered to be most important. The farmers rated their competence in financial and risk management to be most important, but researchers also noticed other factors that indicated success. As unemployment last month reached peaks not seen in six decades, five adjoining states with largely rural landscapes had the lowest unemployment rates in the nation. Wyoming, North Dakota, South Dakota, Utah and Nebraska were all at 3.7 percent or lower in November, compared to 6.7 percent nationally. The following month, the national rate hit 7.2 percent; state rates have not yet been published. Ernie Goss, an economics professor at Creighton University in Omaha, told Dirk Lammers of The Associated Press that the five states have been "insulated, but not isolated" from the recession. Goss says a more stable housing market, willingness to relocate, and a greater margin of error due to smaller sample sizes may all affect the rates. Other contributing factors may include a history of more cautious lending practices, strong commodity prices for wheat, soybeans and corn, and falling fuel prices. (Read more) We would add as additional factors the oil and gas industries in Utah, Wyoming and North Dakota.